Robert Redford thought someone was pulling his leg the first time he met horse trainer Dan “Buck” Brannaman. Interviewing to serve as a consult for Redford’s 1998 film adaptation of The Horse Whisperer, Buck strolled into the filmmaker’s Hollywood office clad as an apparent cowboy caricature, complete with buckskin chaps and a rancher’s hat. It’s an initial reaction shared by viewers of Buck, a debut documentary by director Cindy Meehl about the renowned real-life “horse whisperer.” Opening scenes of Buck and his horse galloping and cantering in slow-motion through sunlit pastures, while the horseman muses via voice-over how one’s horse “is a mirror to your soul.” Viewers may recoil slightly from the too-good-to-be-true conceit, questioning whether they’ve wandered into an infomercial hawking Buck’s instructional videos. The confusion has some merit. Beyond his acumen in the philosophy of “natural horsemanship,” Buck is showman, beginning at age 6 when he and his older brother Bill (stage name “Smokie”) were raised by their domineering father as famous, record-holding trick ropers. However, any misgivings evaporate the first time you witness one of Buck’s horse clinics, when he take the reigns of an unbroken steed trying to buck free from its owner and, within minutes, casually guides the horse around the corral like an pied piper for equines. Like Redford, it’s only once the audience gets to know the soft-spoken, sometimes taciturn Buck and his life story that you appreciate the grace of the man. Deservedly the winner of audience awards at this year’s Sundance and Full Frame festivals, Buck is more than a mere hagiography. Buck’s empathetic brand of horse training has its roots in the merciless physical and emotional abuse his alcoholic father heaped upon Buck and his brother as children, particularly after the early death of their caring mother. Buck’s welts eventually caught the attention of a school coach and local sheriff’s deputy, leading to placement in the large, nurturing home of foster parents Forrest and Betsy Shirley. Buck is a portrait of contrasts, the archetypal American cowboy who also carries an iPod and admits to watching Oprah for tips on what women like (according to the episode Buck references, a man pushing a vacuum cleaner is an aphrodisiac). He’s the silhouette of masculinity cast against a rugged profession, but he is also a sensitive, scarred soul whose career path stems, in part, from a lifelong search for father figure. Vintage footage of horses being “broken” through whipping and other violent means transition to images of Buck’s method of TLC, including little flags he purposefully flickers in front of them. In a similar vein, although Buck's troubled childhood lends necessary context to his life and technique, Meehl refrains from flogging the audience by turning his life into a sentimental recovery narrative. There is inherent loneliness and detachment in the fact that Buck’s vocation removes him from his family 40 weeks out of every year. But, his marriage remains resilient and one daughter joins him on the road during summers and is following in her father’s footsteps as a competitive roper. There are gaps in Meehl’s rendering, most notably the fate of Smokie, who did not participate in the film for reasons the director curiously declined to clarify during a Full Frame post-screening Q–&–A session. Morover, a latent push to deify Buck also persists, making a sequence involving a brain-damaged-from-birth stallion all the more important. Meehl’s camera catches the horse suddenly and viciously attacking its handlers during a clinic, violence that merely hints at the mistreatment it has surely endured. 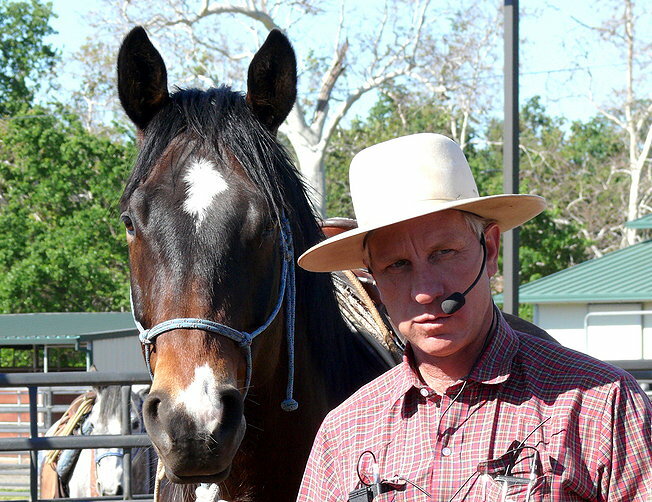 Buck’s characteristically calm countenance cracks with digust and dejection as he chastises the horse’s owner for her misguided rearing. ”The horse didn’t fail us. We failed him,” he laments.